‘Foreign Direct Investment (FDI) is always prefaced with the two words ‘much needed, my colleague Sarah Bracking insisted this week at a Zimbabwe NGO conference. ‘Have you ever heard FDI referenced without those two words?’ We all shook our heads. The FDI mantra is this century’s cargo cult. The meeting was in Harare in August 2015 and dedicated to fighting illegal capital flight from across the African continent. But would some of the region’s sharpest economic-justice NGOs take the next step and also consider fighting legal financial outflows –in the form of profits and dividends sent to TransNational Corporate (TNC) headquarters, profits drawn from minerals and oil ripped from the African soil? The worst FDI tends to come solely in search of raw materials, but commodity prices have been crashing over the past year: oil by 50%, iron ore by 40%, coal by 20% and copper, gold and platinum by 10%. 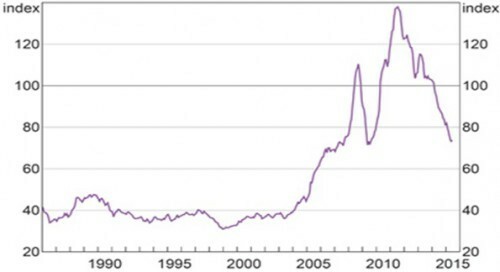 Far greater falls can be traded to prior peaks in 2011 and 2008. Slowing FDI is promising in part because the so-called 2002-11 commodity ‘super-cycle’ appears definitively over, so extractive industry pressure will probably slow dramatically. Although traumatic job losses are on the cards – Anglo American last week announced a third of its South African mining jobs will soon be shed – that could also mean less financial looting of Africa. My argument to the conference proceeded through seven points. First, the category of so-called “illicit financial flows” (IFFs) reflects many of the corrupt ways that wealth is withdrawn from Africa, mostly in the extractives sector. These TNC tactics include mis-invoicing inputs, transfer pricing and other trading scams, tax avoidance and evasion of royalties, bribery, ‘round-tripping’ investment through tax havens, and simple theft of profits via myriad gimmicks aimed at removing resources from Africa. In addition to these tireless researchers and activists, there are also policy-oriented NGOs working against IFF across Africa and the South, including several with northern roots like Global Financial Integrity, Tax Justice Network, Publish What You Pay and Eurodad. The implicit theory of change adopted by the head offices of such NGOs often strikes me as touchingly naïve: i.e., they argue, because transparency is like a harsh light that can disinfect corruption, it is mainly a matter of making capitalism cleaner by bringing problems like IFFs to light. But second, even if IFFs were reduced, there’s another reason that FDI leaves Africa much poorer: what I term Licit Financial Flows (LFFs). These are legal profits and dividends sent home to TNC headquarters after FDI begins to pay off. They are hard to pin down but can be found within what’s called the ‘current account,’ along with trade. So to find out, strip out trading: according to the International Monetary Fund’s (IMF’s) database, the last fifteen years or so witnessed mostly evenly-balanced trade between Sub-Saharan African countries and the rest of the world, with a slight surplus (more exports than imports) from 2000-2008, and then a slight deficit, growing in 2014. Third, the legal LFFs are volatile, no more so than Africa where FDI has fallen from its $66 billion peak annual inflow in 2008 to a recent level around $50 billion. That’s not only thanks to shrunken global commodities markets and the end of the Chinese growth miracle. The UN Conference on Trade and Development (Unctad) also recordsa sharp rise in ‘new national investment policies that are restrictive’ since 2001, though cargo-cult Africa has been slow to keep up with that trend. As a result, nearly everywhere, FDI is in retreat, with 16% less flowing globally in 2014 than in 2013, according to Unctad’s new World Investment Report. This is potentially very good news for those concerned that TNCs loot through LFFs, in Africa and everywhere. 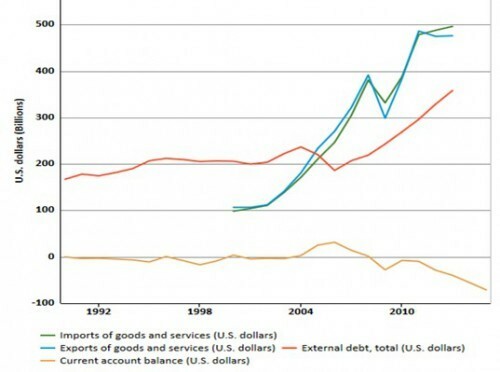 Fourth, getting back to the danger zone in Africa, the current account deficit in turn requires that state elites attract yet more new FDI, so as to have hard currency on hand to pay back old FDI, or to take on new foreign borrowings so as to make payments on home-bound TNC profits and dividends. 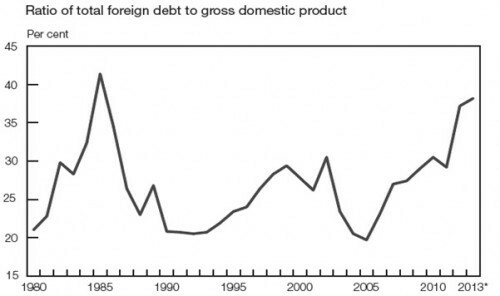 And since FDI is slowing, foreign debt is soaring. For Sub-Saharan Africa, what was a $200 billion foreign debt from 1995-2005 (when G7 debt relief shrunk it 10%) is now nearly $400 billion. Fifth, more nuance is important in terms which firms are doing the looting. It’s not just the Western TNCs, which looted this continent for centuries. The single biggest country-based source of FDI in Africa is internal, from South Africa. In June, the South African Reserve Bank revealed that Johannesburg firms were in 2012-14 drawing in only half as much in profits (‘dividend receipts’) from their overseas operations as TNCs were taking out of South Africa. But that was a step-up from the 2009-11 period when local TNCs pulled in only a third of what foreigners took out of South Africa. It seems that Johannesburg companies have been busier looting the rest of the continent recently. Sixth, a threat to this pleasing trend of declining FDI, and hence less looting, is renewed and yet more frenetic mining. To this end, vast public subsidies may be pumped through the new ‘Program for Infrastructure Development for Africa.’ The donor-supported, trillion dollar project is mainly aimed at neo-colonial extraction of minerals and oil, and its transport along new roads, railroads, pipelines and bridges to new ports, along with electricity generation overwhelmingly biased towards mining and smelting. Patrick Bond’s presentation on BRICS, development and Africa at the ROAPE/JSAS conference in Livingstone in August 2015. So seventh, we should reconsider the historic colonial-era bias of the continent towards extraction of non-renewable ‘natural capital’ – i.e., minerals, oil and gas (the exploitation of which leaves Africa far poorer in net terms than anywhere else) – given how the continent’s net wealth has been shrinking rapidly the last few years, even the World Bank admits in its Wealth of Nations series. We should instead focus economic policies towards rebalancing, which might require, in the short term, that Africa re-imposes exchange controls to better control both IFFs and LFFs, then lower interest rates to boost growth, audit ‘Odious Debt’ before further repayment, and better control imports and exports. It is a sound short-term economic strategy appropriate for what we might hope will be a post-FDI world. In Africa, the name Samir Amin – the continent’s greatest political economist and at 83 still going strong – has been associated with this sort of delinking strategy since the 1960s. I would like to optimistically think that the resonance of these seven points is growing, as fast as the FDI is retreating. Patrick Bond is based at the University of the Witwatersrand School of Governance and the author of numerous books on African political economy.